This lip balm is without a doubt, going to be your new best friend. Throw it in your purse, take it everywhere you go. It is yours to enjoy!!! Balm enthusiasts or occasional balm users will both EOS organic lip balm their next favorite thing. EOS organic lip balm in flavor Strawberry Sorbet is a nice, lightweight, silky smooth balm that is a wonderful addition to every girl's purse!!! The EOS line sprang up not too long ago in my small area, and I purchased it initially because they were placed directly next to the store counter. At that time I purchased the hand lotion, and let me tell you: That is the best hand lotion I have ever bought. I knew instantly I would love this brand in its entirety. And this lip balm is just proof of that statement. First off, this balm feels glorious gliding across your lips. It feels like soft butter that would break under pressure, but it actually has no give!!! It is very sturdy and lasts a very long time. I would compare its smoothness to Maybelline Baby Lips (another amazing lip balm). Prior to this, my go to balm of choice was Nivea Smoothness, but the EOS is even smoother without any sort of texture. Can't get enough of it!!! The scent is absolutely heavenly. As is the case with most balms, the scent usually gives way to either a chemical taste, a very strong taste, or no taste at all, which has always bothered me. 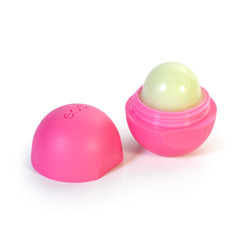 EOS however, leaves just a hint of sugary sweetness on your lips. Apply this before you plan on kissing your mister and watch his eyebrows rise!!! I love cosmetics that make my man take a step back and ask 'what is that???' with a delighted smile on his face. Priceless!!! This balm is not colored at all, which personally, I prefer. Also, it doesn't leave behind a glossy noticeable finish (AKA: Gloss Glare), which makes my lips feel more natural and healthy. The packaging is adorable and fresh without being silly. The container looks like it would be a hard cheap plastic, but it actually has a very appealing matte velvet finish that is common in the EOS line of products. Reviewed by aMutantDream (Eden Reviewer) What's My Line Again?? ?